Through the ages, more poems, hymns, statues, icons, paintings, treatises, and sermons have been produced on this one woman than any other in all human history. 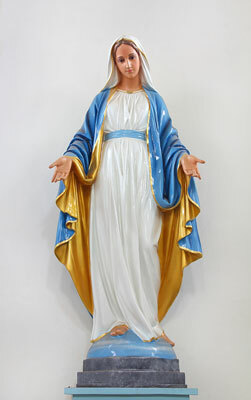 Yet Catholics’ devotion to Mary, known as Marian devotion, has been criticized by non-Catholics as unbiblical or even idolatry. Catholics definitely don’t worship Mary. She was engaged (Matthew 1:18 and Luke 1:27) to a carpenter (Matthew 13:55) named Joseph, whose ancestor was King David (Matthew 1:6–16). She came from Nazareth (Luke 1:26), and it was in Nazareth that the Archangel Gabriel appeared to her and announced, hence the term Annunciation, that she was to have a son and name Him Jesus (Luke 1:31). It is this second role, Mary as the mother of Jesus, that makes Catholics so devoted to Mary. People of other faiths are sometimes baffled by the attention Catholics pay to Mary. To understand why Catholics are so affectionate and attached to her, think about the most primal of all emotions: the strong, penetrating bond between a mother and her child. Nine months in the womb is just one part of it. Mary was not just an incubator in which baby Jesus developed from embryo to infant. Like all mothers, she was a full and true mom in every sense of the word. Motherhood is not just having a baby in your womb for nine months — a mother also shares her DNA with her child. Motherhood is emotional and intellectual as well as biological. A mother is intimately bonded and connected with her child; and in this case, the child was Jesus Christ. Catholic theology teaches that Jesus Christ was human and divine — not 50/50, but true God and true Man. In other words, He was one divine person with two natures — human and divine. And His humanity wasn’t overwhelmed or smothered by His divinity. So whatever He did or was in His human nature was as real and as much a part of Him as whatever He did or was in His divine nature. Whether He was performing miracles from His divinity or feeling and expressing emotions from His humanity, He was still one and the same person. That said, what can be more human than having strong feelings of affection and love for your own mother? So Catholics identify their own feelings for Mary with the feelings Jesus had for His mom, a logical extension of a child’s personal affection for His mother. This feeling is nothing but devotion, without the slightest hint of worship or adoration in it. It would deny His humanity if they denied His love for his human mother. Some people say that the word Blessed in the title Blessed Virgin Mary is idolatry (or Mariolatry, as some call it). But the term and concept is biblical. Mary tells her cousin Elizabeth, “All generations will call me blessed” (Luke 1:48). In the Bible’s original Greek, the word for blessed is markariousin. For nearly 2,000 years, the adjective blessed has been used, and it has never taken away from the ultimate holiness of God — just as when Jesus Himself used the word in His Sermon on the Mount (Matthew 5:3–12): “Blessed are the poor in spirit, for theirs is the kingdom of heaven.” Blessed isn’t a word that’s restricted to divinity, so using it with Mary is okay. Another argument for discouraging devotion to Mary is the claim that Jesus Himself apparently rebuked His own mother and called Her woman rather than mom. This argument claims that if Jesus Himself had to put Mary in her place, Catholics shouldn’t think so highly of her. Proponents of this opinion point to the Bible story of the wedding of Cana, when the guests ran out of wine and Mary told Jesus about it. In John 2:4 in the King James Bible, Jesus responds, “Woman, what have I to do with thee?” The International Standard Version reads, “How does that concern us, woman?” The Catholic response? Proper and accurate Scripture interpretation requires that we never take the text out of context, and that readers consider the original text. Indeed, in the King James version, Jesus says, “Woman, what have I to do with thee?” But the original Greek reads Ti emoi kai soi gynai, which literally translates to “What [is it] to me and you, woman?” This is exactly the same translation in Latin: Quid mihi et tibi est mulier. Instead of a rebuke, Jesus’s words can be interpreted as, “If you’re concerned about it, then I am, too.” In other words, if the fact that they ran out of wine is a concern to Mary, then it is a concern of Jesus, her son. This interpretation makes more sense than one of rebuke when you see what happens next. As soon as Jesus uttered the phrase, He changed the water into wine, performing His first public miracle at His mother’s request. Had it been a rebuke, He probably would have ignored Mary’s request altogether. By granting His mother’s plea for help, He showed that He listened to her as a son, and as God He performed the miracle. Calling His mother woman must also be seen in context with the whole of Scripture. For example, at the cross, as Jesus was dying, some of his last words were to Mary and then to John, His beloved disciple: “Woman, behold your son” and “Behold, your mother.” (John 19:26-27) Using the term woman (gynai in Greek) was actually a compliment because Eve, the wife of Adam, is referred to as the woman (Genesis 2:23). There is a famous line between God and the serpent — “I will put enmity between you and the woman, between your seed and her seed” (Genesis 3:15) — that is considered a prophecy about Mary. You also see Mary associated with the word gynai in the last book of the Bible, Revelation (or Apocalypse) 12:1: “And a great portent appeared in heaven, a woman clothed with the sun, with the moon under her feet, and on her head a crown of twelve stars.” In this passage — as in Genesis 3:15 — Catholics consider the woman referred to as being Mary, the mother of Jesus, because Revelation 12:2 says she was pregnant, and 12:5 says her son will rule all the nations. In fact, Mary is the new Eve because her offspring was Jesus, the new Adam, and He conquered the devil by His death and Resurrection. So when seen in this light, the supposed insult turns out to be a term of endearment.